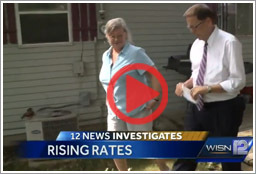 Kent Wainscott of WISN12 reported on September 4th that local home owners have been seeing huge increases in their home insurance policy rates - especially those placed with direct writers such as American Family Insurance, Allstate and State Farm. Direct writers like these have national exposures like huge forest fires, Tornado Alley or hurricanes. They only represent themselves, and therefore generally pass on the hardship to everyone in their book of business. Here in Wisconsin, we have many options to combat this huge increase in home insurance premiums by direct writers like American Family Insurance. The major difference with an independent agent like R&R Insurance is that we are not a “one size fit’s all”. We have numerous carriers with local or regional exposure - thus less risk for the carrier and less costly for you. At R&R Insurance we'll find the best combination of coverage and the best value for your insurance dollar. Wisconsin residents, if you are seeing increases in your home and auto policies that are too heavy to bare, we can help! Click on the Get a Quote button, fill out a few fields and you're on your way to better prices for your home and auto policy. If you prefer to talk on the phone, we can have a knowledgebroker give you a call - just click on the Start A Call button to let us know. We'll be there with affordable coverage that most likely is better than what you were getting with the direct writer.